Made in Japan’ is a simple phrase, but one full of meaning. From kettles and cutlery to chairs, Japan creates some of the most innovative, elegant, whimsical and well-made objects in the world. Combining high aesthetic standards with cutting-edge technology, many of these designs turn everyday items into functional works of art that would look as good in a museum as on a kitchen counter. Made in Japan surveys 100 of the country’s recent design triumphs, among them furnishings, utensils, gadgets, clothing, office equipment and even a silent guitar. While the book features mainly mass-produced objects, it also includes one-off prototypes and limited-edition items that are immensely popular in Japan. Created specifically for the Japanese consumer, these products reflect the way people live, work and play in a country that prizes highly both exceptional craftsmanship and industrial perfection. fascinating to read and look at ... Japan's sense of style and workmanship is seen on every page -- "Things to do in LA"
this fascinating new book surveys 100 outstanding 21st Century utensils, furniture and quirky gadgets ... it's perfect for those searching high and low for ideal finishing touches, or anyone simply wishing to elevate everyday items into works of art -- "Essentials Magazine"
these products are smart, inspiring and deeply human -- "Handful of Salt"
these products are smart, inspiring and deeply human Handful of Salt"
As a compendium of Japanese products that are both aesthetically pleasing and practical to use, Naomi Pollock’s “Made in Japan” hits the mark. As a long term resident of Japan, I have come across many of these; some are in my possession, like Marna’s rice scoop shamoji and Hayashi’s number measuring spoons. The stories behind the products breathe life into these inanimate objects. Through her narrative, the author confirms how Japanese monozukuri has evolved over time yet without compromise. The descriptions provide cultural and historical contexts in which these contemporary products came to be. Injections of little known facts for example, the average Japanese person consuming thirteen boxes of paper tissues a year make for entertaining reading, too. One does not have to be versed in the field of design to appreciate this wonderful book of seemingly ordinary yet quite extraordinary objects that we see in Japan today. 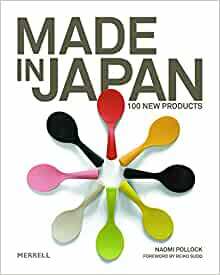 I bought this book because I'm passionately interested in Japanese designers and all things made in Japan. The title had me from the get-go. Made in Japan invites readers to open to any double-page spread and enjoy Pollack's succinct, and inspiring encapsulation of current Japanese designers and their work. Pollack's discerning eye and broad-reaching knowledge go far beyond her architectural background (her books on Japanese architecture are also extremely well-written), but there is nothing pedantic about her presentation of material. Instead, her writing perfectly matches the items, which individually delight the eye, and collectively pose the question of where the future of Japanese design is headed. This a refreshing book, as attractively designed as the items featured inside. The soft spine gives flexibility to the two hard covers sandwiching the material--I've never seen a book bound this way, and its eye-catching as well as wonderfully functional, because you can open it and have the pages stay open. A delight! No book could possibly hold a complete compilation of all current Japanese modern design stars--there are simply too many, and too many good ones at that!--but this is a spirited, varied, and clever selection. Pollack's choices include everyone from old masters to young button-pushers, from chic new takes on classic minimalism to, well, postmodern conundrums! Hard to resist the jaw-dropping elegance of Sato Oki's Thin Black Lines Chair or the brilliance of Takahashi Shunsuke's dish drying rack that rolls into nothing when not in use, for example, but then there's the societal comment implied in Fukasawa Naoto's single-slice toaster, among other bizarre but intriguing entries. There are, actually, so many ways to approach and enjoy this book. I do wish that the condensed designer profiles in the back were numbered or alphabetized, but this is no biggie, given the overall brilliance of the book. Great gift idea for anyone interested in Japan or design! Japanese are ingenious product designers. The description of products describe the ideas behind them and their creators. 5つ星のうち5.0Best Design Products from Japan. One of the best designed products selection. Beautiful creative work and you are able to use it everyday.